A free association flutter of fingers opens Only Bones. 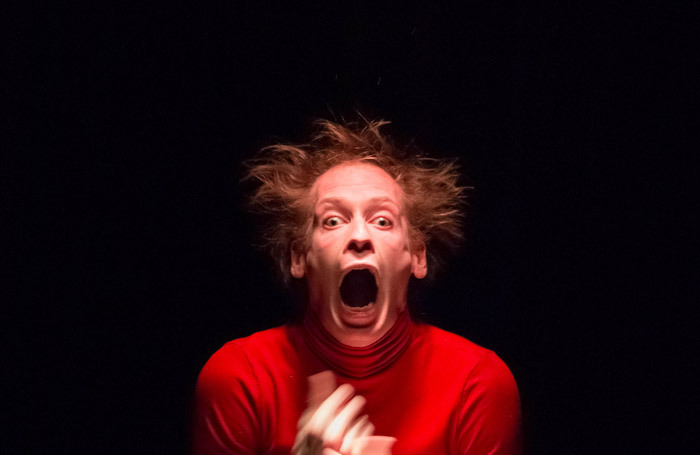 Part of the London International Mime Festival, Thomas Monckton’s show sees him make a stage of his body, obscuring his head behind a lamp which downlights his digits in a deep sea blue. Aquatic creatures made with precise, deft movements of his hands seem to float past and around him: squid, fish and rays, chasing and eating one another. Gradually each corporal agent is introduced to the small spotlit playing space – feet, knees and hands are each given behaviours and intentions, their apparent independence playfully pitted against their indivisibility from the body. Monckton’s imagination summons up bickering sibling hands, portmanteau animals and an arms race. When finally introduced, he succeeds in making his own head seem simply another extremity-turned-puppet, barely sewn to his torso. Bringing his vocal chords into the mix, Monckton reveals a surprising predilection for the self-satisfied hur-hurs of the stereotypical British toff. He rolls these vowel sounds around his mouth, dismantling them without a fully-formed word, discarding them as learned cartoonish behaviours. With unnerving humour reminiscent of Jan Svankmajer stop-motion films, this studied and captivating physical performance from Monckton is supported by joint-crunching, tendon snapping industrial beats and sound design from Tuomas Norvio. Only Bones races through its all too brief running time. As short defined and intense sketches give way to loosely connected gestures and call-backs, the piece loses some of its distinctive power in the second half, but he remains a performer to seek out.